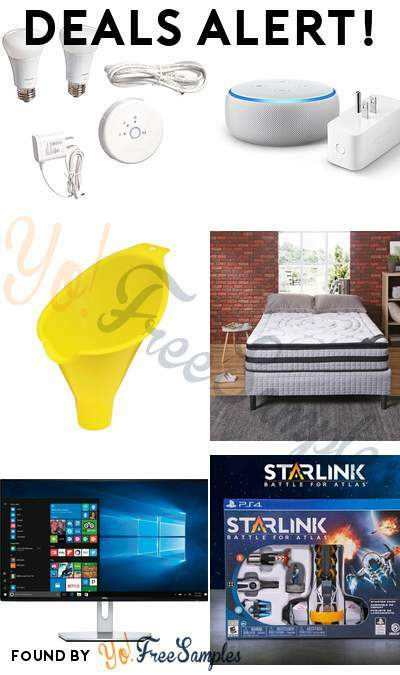 The prices in this deal round up were accurate as of 2019-03-24 03:39 EST. The prices may have changed since then. 63% OFF Philips Hue Lux 60W Equivalent A19 LED Personal Wireless Lighting Starter Kit, 1st Generation, Compatible with Alexa. : You can get this for only $29.57 here and it’s normally $79.99 at Amazon. 68% OFF Hopkins 10703 FloTool Spill Saver Radiator Funnel: You can get this for only $0.62 here and it’s normally $1.99 at Amazon. 68% OFF Modern Sleep 12 Inch Wrapped Coil Pillow-Top Mattress-in-a-Box: You can get this for only $335.20 here and it’s normally $1,049.99 at Walmart. 43% OFF Dell – S2419NX 24″ IPS LED FHD Monitor – Black/Silver: You can get this for only $129.99 here and it’s normally $229.99 at Best Buy. 73% OFF Starlink: Battle for Atlas Starter Pack – PlayStation 4: You can get this for only $19.99 here and it’s normally $74.99 at Best Buy. 42% OFF Sony – High Power XB60 Portable Bluetooth Speaker – Black: You can get this for only $199.99 here and it’s normally $349.99 at Best Buy. 51% OFF Bulwark Flame Resistant 6 oz Cotton/Nylon Excel FR ComforTouch Regular Deluxe Coverall with Concealed Snap On Cuff, Navy, Size 58: You can get this for only $55.72 here and it’s normally $113.85 at Amazon. 53% OFF Hillsdale Furniture 4543-812 Hillsdale Garden Park Rectangle Dining Table, Gray/Espresso: You can get this for only $160.56 here and it’s normally $349.00 at Amazon. 43% OFF Callaway Golf 2018 Men’s Rogue Fairway Wood, Right Hand, Synergy, 60G Shaft, Senior Flex, 11 Wood, 25 Degree: You can get this for only $141.72 here and it’s normally $249.99 at Amazon. 69% OFF Reiko Samsung Galaxy J3 Rhinestone Wallet Case – Retail Packaging – Silver: You can get this for only $4.00 here and it’s normally $12.99 at Amazon. 55% OFF Liberty P15790C-MN-C 29mm Panache Cabinet Hardware Knob: You can get this for only $1.75 here and it’s normally $3.89 at Amazon. 68% OFF Stufurhome ST1300MB Faucet, Black: You can get this for only $82.52 here and it’s normally $259.00 at Amazon. 50% OFF The C64 Mini: You can get this for only $39.99 here and it’s normally $79.99 at Amazon. 66% OFF Kershaw Link Blue Aluminum BlackWash Pocket Knife (1776NBBW); 7.6” 420HC Stainless Steel Blade and Machined Aluminum Handle with SpeedSafe Assisted Opening, Liner Lock, Reversible Pocketclip; 4.8 OZ. : You can get this for only $41.33 here and it’s normally $124.99 at Amazon. 44% OFF Marvel MM13R Mystery Oil – 32 oz. : You can get this for only $3.88 here and it’s normally $6.99 at Amazon. 81% OFF Cordless Screwdriver, Electric Screwdriver Rechargeable, 4V 2000mAh Li-ion, MAX Torque 4Nm – Dual LED, Palm-Sized, Various Bits, Power Indicator, USB Charging with Cable -TDSC02P: You can get this for only $9.99 here and it’s normally $54.99 at Amazon. 62% OFF Mainstays 2 in 1 Portable Heater Fan, 900-1500W, Indoor, Black: You can get this for only $14.97 here and it’s normally $39.99 at Walmart. 58% OFF Honeywell Topfill Humidifier, Black, #HUL570WNF: You can get this for only $24.97 here and it’s normally $59.99 at Walmart. 50% OFF Better Homes and Gardens Langley Bay Bar Cabinet, Multiple Colors: You can get this for only $99.00 here and it’s normally $199.99 at Walmart. 46% OFF RCA 70″ Class 4K Ultra HD (2160P) Smart LED TV (RNSMU7036): You can get this for only $699.99 here and it’s normally $1,299.99 at Walmart. 50% OFF Better Homes and Gardens Bryant Dining Bench, Espresso: You can get this for only $49.00 here and it’s normally $99.00 at Walmart. 51% OFF Sceptre 43″ Class FHD (1080P) LED TV (X435BV-F): You can get this for only $169.99 here and it’s normally $348.00 at Walmart. 48% OFF BLACK+DECKER DUSTBUSTER Quick Clean Cordless Hand Vacuum, HNV115J06: You can get this for only $12.29 here and it’s normally $24.00 at Walmart. 66% OFF Lauren Ralph Lauren Navy Solid Wool UltraFlex Classic-Fit Suit: You can get this for only $199.99 here and it’s normally $600.00 at Macys. 60% OFF DKNY Allure 20″ Hardside Carry-On Spinner Suitcase, Created for Macy’s: You can get this for only $89.99 here and it’s normally $225.00 at Macys. 79% OFF Karen Scott 3/4-Sleeve Open-Front Cardigan, Created for Macy’s: You can get this for only $9.96 here and it’s normally $49.50 at Macys. 70% OFF Macy’s Diamond Stud Earrings (1/3 ct. t.w.) in 14k Gold, Rose Gold or White Gold: You can get this for only $299.00 here and it’s normally $1,000.00 at Macys. 85% OFF Macy’s 18″ Cultured Freshwater Pearl Strand Necklace (7-8mm) in Sterling Silver: You can get this for only $29.00 here and it’s normally $200.00 at Macys. 74% OFF Macy’s White Cultured Freshwater Pearl (6mm) Necklace and Matching Stud (7-1/2mm) Earrings Set in Sterling Silver: You can get this for only $39.00 here and it’s normally $150.00 at Macys. 83% OFF Alfani AlfaTech by Men’s Solid Athletic Fit Dress Shirt, Created For Macy’s: You can get this for only $9.96 here and it’s normally $60.00 at Macys. 41% OFF 32 Degrees Hooded Packable Puffer Vest: You can get this for only $34.99 here and it’s normally $60.00 at Macys. 61% OFF The Big One 12-pc. Bath Towel Value Pack: You can get this for only $34.99 here and it’s normally $89.99 at Kohls. 41% OFF Croft & Barrow Affleck Men’s Ortholite Cap-Toe Dress Shoes: You can get this for only $34.99 here and it’s normally $59.99 at Kohls. 59% OFF Men’s Apt. 9 Slim-Fit Easy-Care Dress Shirt: You can get this for only $12.99 here and it’s normally $32.00 at Kohls.